It’s here: the Iowa City Public Library’s Top Picks for 2017! Staff members nominated nearly 100 books released in 2017 as their favorite reads of the year. Those that made this list were nominated by more than one person, which truly makes them the Best of the Best. Our Best Book Overall for 2017 is The Hate You Give by Angie Thomas. This debut novel was nominated by more staff members than any other book this year, which makes sense given all the other Best of 2017 lists it has appeared on this month. If you haven’t read it, be sire to check out a copy before the movie is released! What do you call a cow murder mystery? Okay, so that’s pretty bad, but these books are great (and none of them has anything to do with a cow)! Mysteries have surged in popularity lately, and the genre has expanded to include cozy mysteries, hard-boiled mysteries, thrillers, supernatural mysteries, and more. I just finished two books and both are highly recommended summer reads. Vicious Circle by C.J. Box takes the reader on a vicarious trip to the Wyoming and the life of Game Warden Joe Pickett. Joe is in a battle to save his life and the lives of his family. Rodeo star Dallas Cates is out of jail and he wants revenge. Nate Romanowski, Joe’s falconer friend, gets pulled into the drama and trouble always seems to find Joe and Nate. Box’s novels are known for their fast pace, memorable characters and strong sense of place. The reader will be kept on the edge of their seat in this page-turner. I listened to the book and David Chandler’s narration is excellent. If you are looking for a great book to kick off your summer, consider these two novels or stop by the Library or Bookmobile. We’re always happy to help you find a great read! The Book Madness brackets have been updated to show titles advancing to the Second Round. What books will make our list of Best Books of 2016? It’s a mystery, as are these stories. From the author of Warning: Do Not Open this Book, Please, Open this Book, and Chicken in Space comes a brand new adventure! 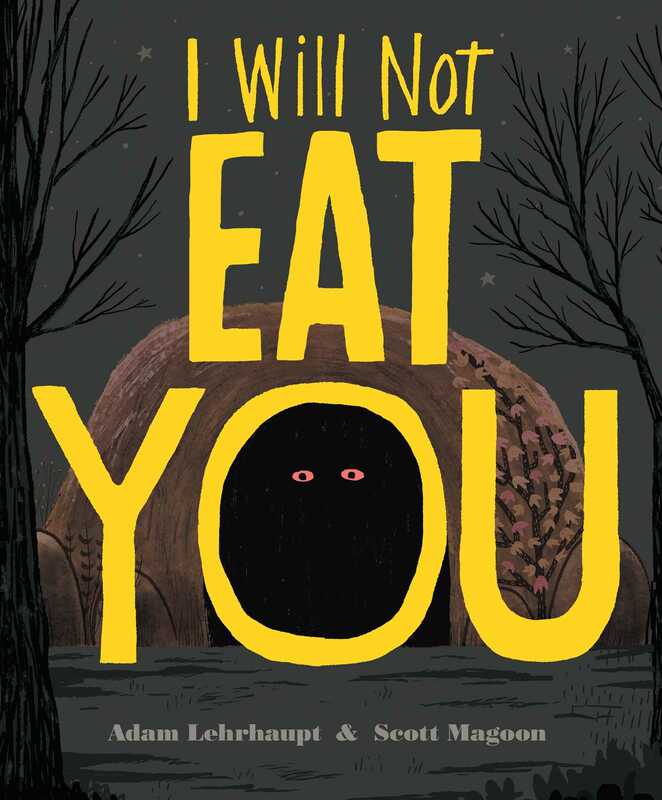 I Will Not Eat You by Adam Lehrhaupt, illustrated by Scott Magoon, is a delight and perfect for this late-onset autumn. It has everything you could possibly want as the days get shorter: mystery, suspense, chase scenes and happy endings (maybe?). The dark color palette hints at the story’s capacity for equally colored humor and continually builds suspense concerning who our not-so-hungry protagonist might be. It is only when the stakes are highest that the true identity of the creature in the cave is revealed. For more fun hints as to the identity of this stranger, check out the book trailer below, or better yet, the book! Summer is here and for me that means time for reading and relaxation. At the Help Desk our patrons often ask, “What have you read recently that you really liked?” I love these questions because it helps me think about books and why I liked them. I thought I’d share my recent list in case you are looking for a good book for your relaxing summer reading. I also discovered there’s a new name for one of my favorite genres: Biographical Fiction. I’ve always thought of these books as “Historical Fiction” but recently I’ve been seeing the term “Biographic Fiction” more and it makes sense. These are books with stories based on real people, but often the dialogue and other details are created by the author to move the story. Melanie Benjamin includes an interesting commentary about how she approaches writing Biographical Fiction in the Author’s Note at the end of The Swans of Fifth Avenue. How many mystery writers does it take to screw in a light bulb? Two. One to screw it almost all the way in and the other to give it a surprising twist at the end. When you are finished giggling (or groaning) over that joke, check out the books Library staff chose as the best mysteries of 2015! Okay, I’m using the term “read” here liberally as I’m really listening to her audiobooks. But the sentiment is the same: after a long aversion to mainstream romance and mystery, what do Janet Evanovich’s stories have for me? OK … I’m ready to forgive C.J. Box. I thoroughly enjoy his Joe Pickett series and enjoyed The Highway, (awesome book, set in Yellowstone, scared the bejeebers out of me) Hoyt is conquering his demons and mentoring a new Sheriff’s Detective, Cassie Dewell. But something goes wrong and suddenly readers are left hanging. In The Badlands, Detective Cassie Dewell takes a new job in Grimstad, the petroleum capitol of North Dakota. Life is tough there. The economy is booming but crime follows money and Cassie is tasked by the Sheriff to do some internal investigating. She is also haunted by her past and the criminal who got away and is still lurking “out there.” She’s also drawn to a young boy who may be invisible, but knows a lot more than the world is willing to acknowledge. The book is fast paced, the characters are great, and readers are left wanting more from this new protagonist. I think we have a lot to look forward to from C.J. Box and his Joe Pickett and Cassie Dewell series!